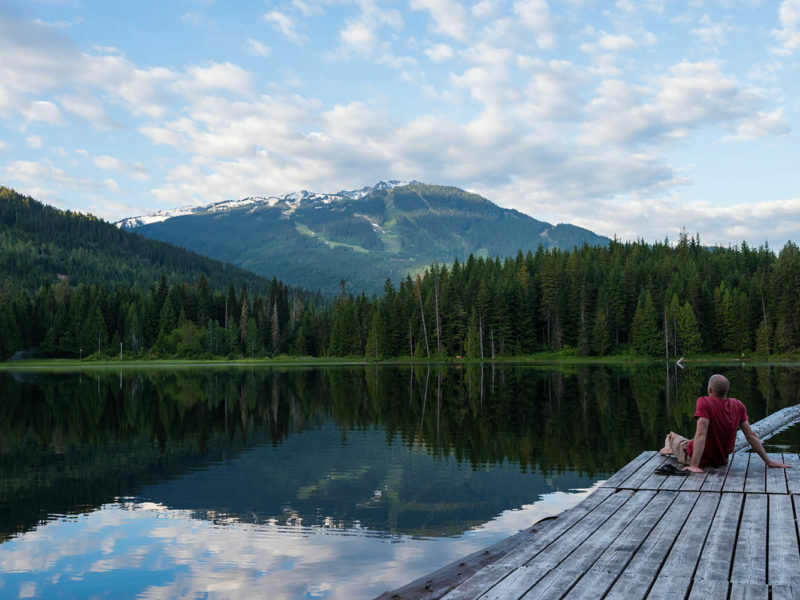 Morning views at Lost Lake — one of many stunning lakes that surround Whistler, making for a popular visit in summer. We all know Whistler Blackcomb is synonymous with snow and slopes, but what happens to Canada’s best-known winter wonderland once the ice melts? Three million — that’s more than the entire population of Brisbane, but still less than the number of visitors who frequent Canada’s Whistler Blackcomb resort every year. While North America’s number one ski resort sees a similar share of this gargantuan figure across winter and summer, it’s taken a while for Australians to appreciate the appeal of British Columbia’s world-renowned slopes sans snow. That is, until now. 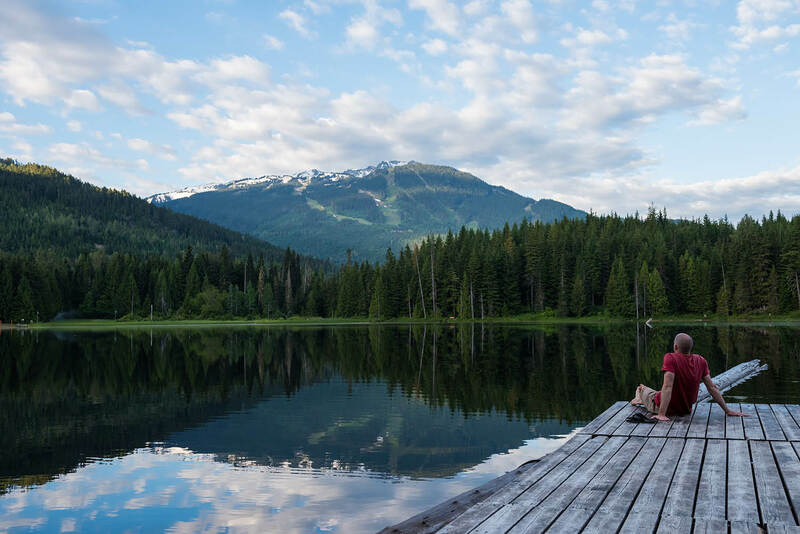 “Compared to 10 years ago, the number of Australian visitors in the summer has quadrupled, while winter has more than doubled,” says Tourism Whistler’s Director of Market Development, Shawna Lang, as we follow the snaking path through Whistler Village. Hiking through ancient cedars to Cheakamus Lake — another popular Whistler activity during summer (photo: Mike Crane). “Now, of the annual Australian room nights [that’s industry speak for local accommodation booked by Aussies], 40 per cent are during the summer and 60 per cent are during the ski season,” she adds, as I look around a distinctly different Whistler. Where I’m accustomed to seeing bars brimming with beanie-wearing snow bunnies and icicled racks crammed with snowboards and skis, are now tanned travellers and robust mountain bikes, both glistening in the hot sun. As Shawna points out, it’s these throngs of mountain bikers that now make up the bulk of Aussies visiting this time of year. Whistler Bike Park, which is seeing an increasing number of younger Australian visitors coming to hit the bike trails (photo: Justa Jeskova). “While we see many retirees on tour in summer, there are an increasing number of younger Australian visitors coming here to hit the bike trails.” As neither a retiree nor a daredevil nut job (seriously, some of the descents on Whistler’s many bike trails are horrifying), what is there to do here in summer for those who don’t fit into either category? Well, as I find out over the coming days, lots. To begin my Whistler summer experience, today I’ve opted for one of the resort’s more mellow adventure activities; ziplining. I say mellow because there’s no degree of skill required (unlike biking), but it does still entail a helmet and adrenaline rush as we arrive atop Cougar Mountain for the first leap of faith into this aerial tree course. Run by The Adventure Group, Superfly Ziplines is merely one of a dozen outdoor pursuits offered here throughout summer, alongside whitewater rafting, mountain biking, stand-up paddle boarding, canoeing, jet boating, quad biking, bungee jumping… But back to ziplining; strapped into a harness and an unnervingly simple metal contraption that sits over a kilometre-long line, our guide counts down from three before pushing the harness forward, launching me more than 150 metres above a sea of ancient cedars, spiking up from below. A stunning alpine hike on Whistler Mountain — one of many popular activities during summer (photo: Mike Crane). Remind me, why didn’t I choose to chill out at the Scandinave Spa instead (which, by the way, is open year-round)? Initial stomach flips and screams out of the way, the ride quickly proves a thrilling way to see Whistler’s dense backcountry, to inhale that crisp mountain air, to feel the summer sun on your skin, all with minimal exertion. Happily, it’s only the first of four different ziplines included in the tour (each varying in length, height, and speed), connected by a network of short walks and boardwalks. As soon as we’re back on land again, we’re swiftly suspended in the air again, taking in brilliant 360-degree views from the iconic Peak 2 Peak Gondola. Connecting the peaks of Whistler and Blackcomb mountains, this glass-walled capsule carries travellers over four kilometres between summits, making for an incomprehensively scenic transfer to the newly renovated Rendezvous Lodge atop Blackcomb. While the lodge houses an array of lunch options, we walk through to the sophisticated Christine’s on Blackcomb restaurant. Think wide glass windows, tasteful timber and copper details, and a contemporary Canadian menu that’s focused on ethically sourced ingredients. But it’s not just the perfectly seared scallops that diners come for — here you’re also treated to front row seats to see marmots sunbathing on the rocks below. In fact, it was the whistling calls that these furry little guys make to one another that inspired the name of the resort back in the 1960s. Marmots aren’t the only local wildlife to come out and play this time of year; summer is also prime time to spot black bears. Unlike winter when they’re in the deep depths of hibernation, summer sees these beautiful beasts saunter out of the alpine woods to feed on grasses and wildflowers that blanket Whistler’s would-be ski runs (photo: Brad Doerksen and Whistler Photo Safaris). Marmots aren’t the only local wildlife to come out and play this time of year; summer is also prime time to spot black bears. Unlike winter when they’re in the depths of hibernation, summer sees these beautiful beasts saunter out of the alpine woods to feed on grasses and wildflowers that blanket Whistler’s would-be ski runs. There are a number of operators that offer bear-watching experiences in the area, but our pick is Whistler Photo Safaris — taking animal lovers on personalised safaris around the otherwise inaccessible, Whistler Olympic Park. After lunching on divine shareables from barbecued duck salad to beef short ribs (which, FYI, were charred for a casual 48 hours), this still isn’t even the pinnacle of Whistler’s food scene. Well, at least not in the physical sense. The afternoon is spent making our way to a distinctly Whistler dinner experience by the name of Salmon Bake. Run by Canadian Wilderness Adventures, the venture takes you on an ATV (quad bike) tour a couple of kilometres up Blackcomb to Crystal Hut; perfectly positioned to take in what are arguably the best views of British Columbia’s most iconic mountaintops. Then to top it off, you’re served maple glazed wild BC salmon (alongside local vegetables). And if that wasn’t Whistler enough, the return ride back includes a cameo appearance of a black bear, perched on a grassy knoll we drive past, nonchalantly munching on wildflowers. Oh Canada! Covered in dust, filled with salmon, and high on alpine air, I retire to the Fairmont Chateau Whistler, joining a growing number of Aussies choosing summer over winter in Whistler. And for good reason.